Our mission serves individuals, families and friends affected by MPS in the following ways. 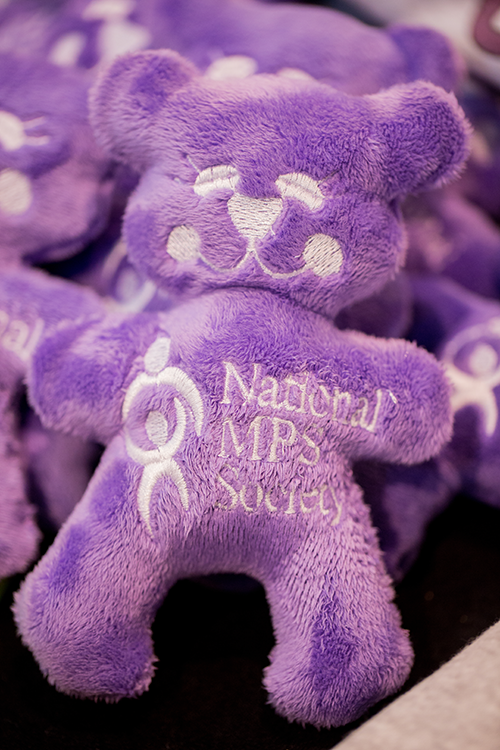 The National MPS Society and its members raise money to provide student fellowships and fund research projects. We participate in and host technical conferences that allow researchers to collaborate and discuss their findings. We collaborate with other lysosomal storage disease (LSD) patient support groups and family research foundations to fund research. Our family support programs range from continuing education scholarships to medical travel expense assistance, and we publish a series of resource guides dealing with specific syndromes and treatments that can help families learn more about the MPS diagnosis and the future to come. Our digital newsletter, Courage, features stories on research and medical advances, family news, upcoming events, advocacy opportunities and fundraising efforts. Each year, we hold a conference at different locations, enabling families to meet and learn more about their disease. We also provide emotional support to all those affected by MPS. We sponsor public events, craft press releases, publish syndrome and treatment materials, and maintain a website. This website provides updates on research, legislative activities, family support and upcoming events. We work toward enhanced treatment research and cultivate working relationships with congressional offices and government agencies and advocate for enhancements to federal programs, such as SSI, Medicaid and others important to our families. We participate in international symposiums with a global contingent of medical and scientific professionals and networks with a growing number of international sister organizations. Plans were made to become incorporated and apply for tax-exempt status. Publishing a newsletter to share and provide information become a priority, and fundraising projects soon followed. The organization realized the need to expand existing research and to promote new research. The initial $5 membership fee to offset the cost of publishing and mailing our newsletter was increased in 1978 to $10. In 1990, the membership categories increased to include professional members and families living outside the US. At the June, 1974, meeting, officers were elected to a temporary board, and the name changed to “The MPS Society.” The board of directors set up a Parents Referral Plan (PRP) to put families in contact with other families to discuss their mutual concerns. The board of directors began learning the complex medical information about these disorders in order to better inform the members of the organization. By May, 1976, the organization boasted a membership of 34 families. September, 1975, was a milestone for the MPS Society with the organization becoming incorporated and holding the first seminar, attended by 33 people. The next year form 1023 was filed for tax-exempt status, and an election was held with a new board of directors elected. By 1979, the membership increased to 150. In 2009, the National MPS Society celebrated its 35th anniversary. The accomplishments between 2000-2004 were considerable. In 2000, our 5k walk/runs began with seven events bringing in $100,000. In 2009, we raised more than $285,000 from 21 events. Ten years later, this has led to more than $3.5 million awarded for research grants. In April, 2003, the first enzyme replacement therapy (ERT) for an MPS disease was approved by the FDA, Aldurazyme for MPS I. Naglazyme, the ERT for MPS VI was approved in 2005, and in 2006, the FDA approved Elaprase, ERT for MPS II. Getting the enzyme into the brain is the next step, and clinical trials and research continue as we get closer to a cure. Our Family Support program includes such programs as yearly funding for regional social events, conference scholarships, the Family Assistance Program, Exceptional Experiences, and education scholarships.The CYCLE program (Celebrating Your Child’s Life Experiences) acknowledges the families whose loved one has passed on from MPS. CYCLE conferences are held for the bereaved parents. Our website is now our primary communication vehicle for the public and for our members, and we have over 9000 supporters in our database. In addition to our syndrome booklets, we have specialized booklets on Management, Education, and Anesthesia. We continually add to our series of fact sheets. In 2006, we partnered with the Canadian MPS Society to publish an educational booklet titled “Daily Living with MPS and Related Diseases”. Our yearly conferences continue to remain a great source of practical knowledge and emotional strength. International MPS Day, May 15th, is the day to remember all the children and adults who currently suffer from MPS and related diseases and those whose struggle has ended. Through the Legislative Advocacy committee, we work with Congress to express our concerns to government agencies, such as the National Institutes of Health, Department of Education and the FDA. Legislative advocacy efforts has increased research funding from NIH for MPS and related diseases. Funding has increased from $5.9 million in 1997 to $9.3 million in 2004. We are partnering with other lysosomal storage disease (LSD) support groups to offer research grants for treatment of the central nervous system. This partnership also focuses on education and increased awareness of these diseases. Both nationally and internationally, researchers, scientists and LSD support groups are joining together in the common goal of finding cures for these diseases. The advances in recent years from a grassroots organization could not have happened without the tremendous support of our members, our families and friends, our Scientific Advisory Board, and, in recent years, our friends in the pharmaceutical companies.